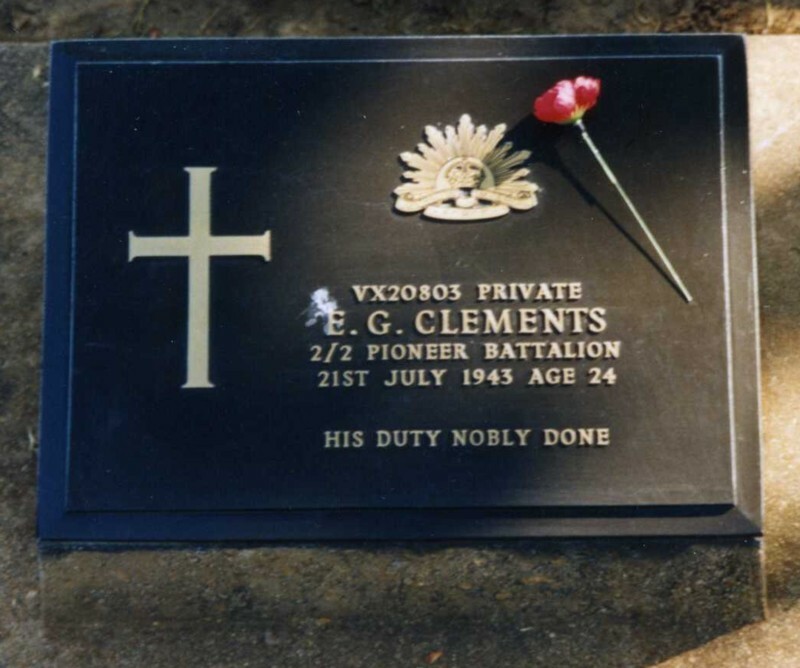 Background : Son of Robert Badger Clements and Agnes Orwell Clements, of Cobden, Victoria, Australia. Third son of four others serving in the Army. Local football team member and a keen sportsman. 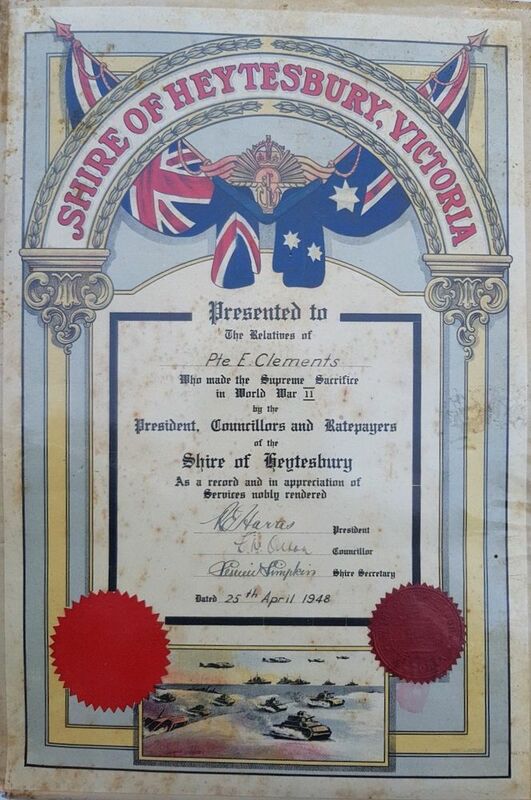 Shire of Heytesbury commemorative scroll to his family reads : Presented to the Relatives of Pte E. Clements who made the Supreme Sacrifice in World War II by the President, Councillors and Ratepayers of the Shire of Heytesbury as a record and in appreciation of Services nobly rendered. 25/04/1948. Japanese Java Party 6 Prisoner of War. 04/01/1943 Embarked Java on Usu Maru with 1970 Prisoners of War. 07/01/1943 Disembarked Singapore and party split up. 20/01/1943 From Singapore overland on Train 37 to Thailand with 625 Prisoners of War. A Red Cross enquiry was made about Pte. Clements, enquiry number 43146 : CLEMENTS Given Name(s) or Initials: E G. Military Service Number or Last Known Location: VX20803 Missing, Wounded and Prisoner of War Enquiry Card Index Number: 43146. 191383. Item: [2016.0049. 09867] "Clements, E G, VX20803". Service & personal summary At enlistment : single. No previous military experience. Hazel eyes, dark brown hair. Marks / scars : 1 inch scar medial left knee. 01/06/1940 Taken on strength Recruit Reception Depot Caulfield, Victoria. 03/06/1940 Posted to 2/2 Pioneer Battalion Puckapunyal, Seymour, Victoria. 24/08/1941 Evacuated to 1 Australian Corps Rest Station with Not Yet Determined (N.Y.D.). 30/09/1941 Discharged 1 Australian Corps Rest Station to unit. 30/09/1941 Rejoined unit from 1 Australian Corps Rest Station. 15/10/1942 Reported missing in action believed prisoner of war. 21/07/1943 Died of illness (cholera) in Thailand whilst prisoner of war.